MailChimp is a powerful marketing platform that helps millions of businesses create email marketing campaigns, without requiring any coding experience or technical background. Free for up to 2,000 subscribers and 12,000 emails/month. Growing Business tier starts at $10/month up to $25/month (depending on number of subscribers), and includes support, and automation / autoresponder. Additional $199/month in addition to the $10-$25/month for Pro features like advanced customer segmentation capabilities, and multivariate testing. 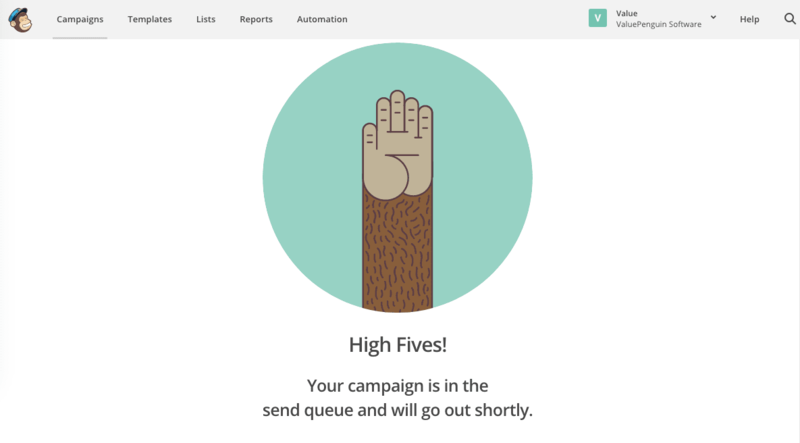 Is MailChimp the right software for you? Founded in 2001 and headquartered in Atlanta, MailChimp has quickly grown into one of the most recognized email marketing services in the world, and is currently used by over 15 million businesses. One of MailChimp's primary selling points is that it requires minimal technical expertise, and no coding capabilities, in order to create professional marketing campaigns. All of MailChimp's features are intuitive and easy to learn, and the company does a good job of educating its new users by providing them with educational emails, comprehensive how-to articles, and research guides about the email marketing industry. Though MailChimp doesn't require users to have any technical background, if you do have some web development experience, you'll be able to integrate your email marketing efforts into the rest of your business through MailChimp's API. MailChimp offers an API (Application Programming Interface) that developers can use to connect MailChimp with your organization's database and the rest of the applications in your production environment. This is useful if, for example, you were the owner of a small ecommerce store, and wanted to run an email marketing campaign that alerted users that your inventory was selling out quickly and that they should act fast if they want to make a purchase. In this scenario, you'd be able to trigger MailChimp to alert customers whenever your inventory dipped below a certain threshold. Without this API access, executing this action would take great attention to detail and a manual series of steps. MailChimp has done an excellent job of making email marketing accessible to people of all types of levels of technical experience. It also offers a generous free level of its product, which enables small businesses to send emails to up to 2,000 subscribers. This is ideal for businesses that are still growing their subscriber base, and are interested in dipping their toes in a product that has the potential to help grow their existing business. Although more powerful features are only available for paid accounts, the company recently announced that two features previously reserved for paid accounts (marketing automations and product recommendations) are now free for all users. This indicates that the company is serious about offering quality features to all of its users, even those who don't currently pay for the service. Other features, like specific segmentation of complex populations, are only available to paid users. This makes sense, since the larger your subscriber base is, the more important it is that you actively attempt to segment that population and send emails that are specifically tailored to those areas of your audience. Sending more relevant emails to targeted segments of your audience can help decrease the unsubscribe rate, boost your click rate, and hopefully boost sales or engagement with your business. As such, you can think of MailChimp's paid features as a deeper investment in your business's marketing strategy. Customer support is only included for paid customers. A downside to MailChimp is that even for paid customers, there isn't any phone support -- all support is handled through email or live chat. Though this may be sufficient for simple questions, it can be difficult to communicate complicated issues over email / live chat, so it would be nice if MailChimp would offer phone support. With 15 million users, MailChimp has made a name for itself as a major email marketing resource, which also opens doors to another unique benefit: the ability to analyze its customers' successes and failures, and relay that analysis back to its users. The company has invested heavily in researching what goes into a successful email, and in turn, it offers these insights to its customers in order to help them learn from other MailChimp users. The company also shares helpful insights about everything related to email marketing, including which email provider is most popular among its customers' subscribers (Gmail), what time most people stop checking their emails (after 9 p.m.), and other interesting information that marketers can apply in order to fine tune their own strategies. MailChimp includes many built-in features that help streamline the process of creating and scheduling your first email campaign. We'll walk through several of them in more detail below. Newsletters can be a powerful way to connect with your customers, and keep you at the top of their mind. You can also use newsletters to help communicate important deals or events to your customers. MailChimp makes creating email newsletters simple -- you can get started creating your first newsletter in minutes. 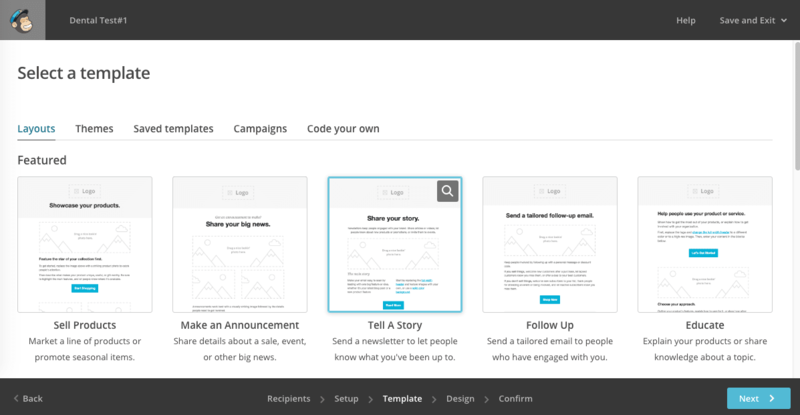 MailChimp offers various templates, which cover almost every type of email newsletter that you may want to create. The design and user interface is somewhat reminiscent of Wix, with placeholder text and images to give you a rough idea of what the final newsletter should look like. You then simply use the user interface to click, edit, and customize the images and text to your liking. Images are stored in your MailChimp account for free. This is convenient, especially if you plan to use the same image across multiple emails (for instance, your company logo) -- you won't need to manually upload the image each time. Instead, once you've uploaded it to your account's media library, you can simply create a new template that includes that image. When you've finished making updates to the newsletter, you see what the final product looks like by sending a test version to yourself and/or to a colleague. You can also see what the email will look like for phone users, so that you can be sure your newsletter is mobile-friendly as well. 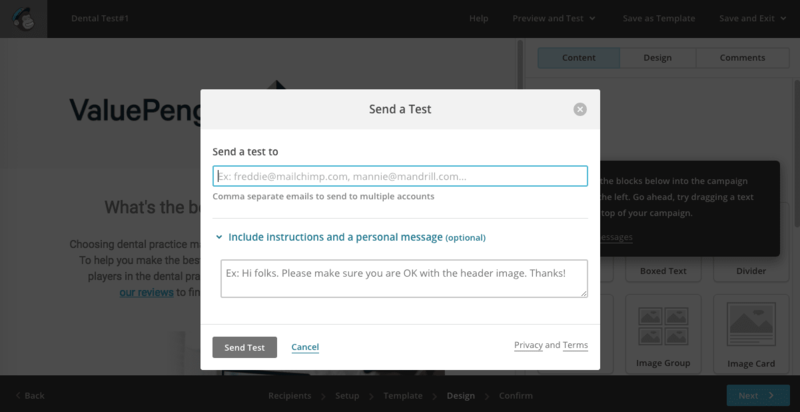 When testing your email campaign, you have the option to send it to yourself and/or other people on your team. If you send it to someone else, MailChimp includes the option to add a note at the top of the email, so that the recipients can know what to focus on as they read over your test email. Once you've perfected your email, you can schedule MailChimp to deliver your email on a specific day and time. The other scheduling options are only available to paid accounts. Paid accounts can choose to deliver an email campaign in batches, so as to balance out traffic to the links included in the email. This is most likely only relevant or important to you if you have a large number of subscribers, in which case, you probably already need to have a paid account. Another paid feature is called Timewarp, which delivers the email at the same time to all of your subscribers, depending on their various time zones. Therefore, instead of delivering it at 3 p.m. EST and 12 noon PST, you can specify that it should go out at 3 p.m. for everyone, no matter what time zone the recipient is in (meaning it will send to the East Coast at 3 p.m. EST, and then to the West Coast three hours later, at 3 p.m. PST). As mentioned earlier, MailChimp releases informative research reports that suggest that the majority of users tend to stop opening their email after 9 p.m. Timewarp is designed to help you ensure that none of your users receive their emails after 9 p.m. This becomes particularly important if you have international customers across vastly different parts of the world. 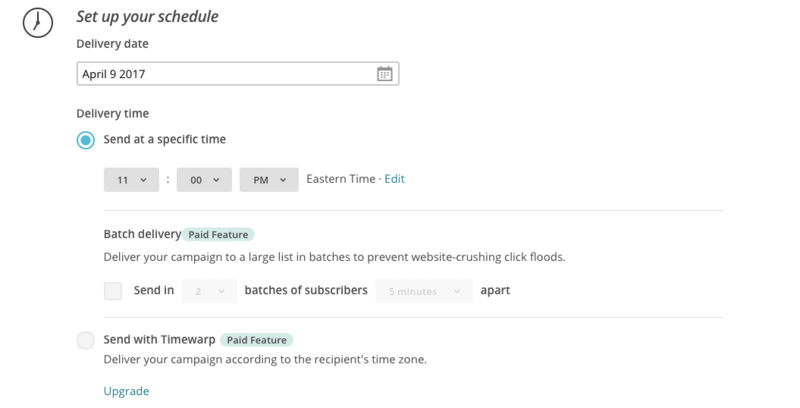 Instead of having to create a different list and campaign for your customers in various locations, you could use MailChimp's paid Timewarp feature to send out emails without having to create multiple email lists. Once you've scheduled your email, you will get a confirmation that your campaign has made it into MailChimp's "to-send" queue, which means that you should start seeing results in a report shortly after the scheduled delivery time. As common sense and MailChimp research both confirm, buying third-party email lists isn't effective in the long run -- and in fact, using a purchased list is against MailChimp's terms of service, and has been demonstrated to result in a higher rate of spam complaints. In order to grow your subscriber base with quality leads, you can't take a shortcut by purchasing a list. You need to create high-quality content -- and you also need to give people an easy way to sign up to receive that content. One way to facilitate that need is by strategically placing attractive signup forms on your website and social media pages. 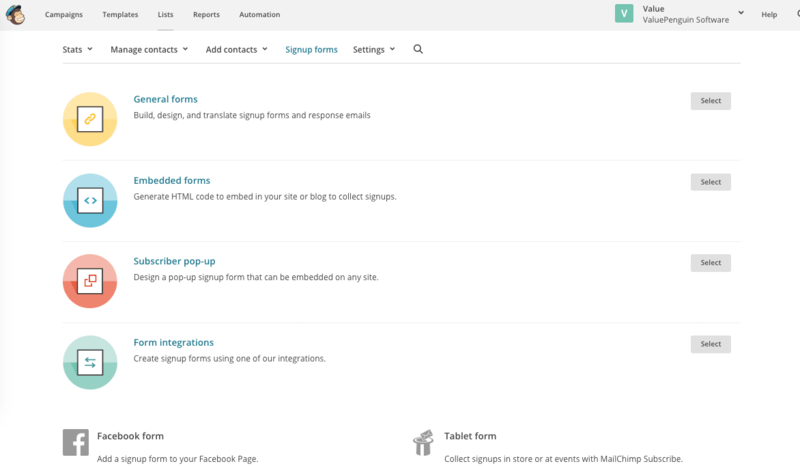 MailChimp's signup forms are a timesaving feature that can help you do just that, as quickly as possible. MailChimp offers a vast selection of signup form options, including popup forms that can be embedded on your blog or website, forms that are suitable for emailing, and forms to add to your Facebook page. Just like the email campaign templates, you simply replace the placeholder text with your own custom messaging. In addition to helping you attract new subscribers with signup forms, MailChimp also helps you retain your current subscribers by helping you automatically comply with federal regulations that you may not be aware of, such as the FTC's CAN-SPAM Act. This regulation requires you to use a physical address in your email campaigns. MailChimp will ask you for this address when you sign up for an account, and then automatically will include it in every email design template so that your emails will always comply with this regulation. 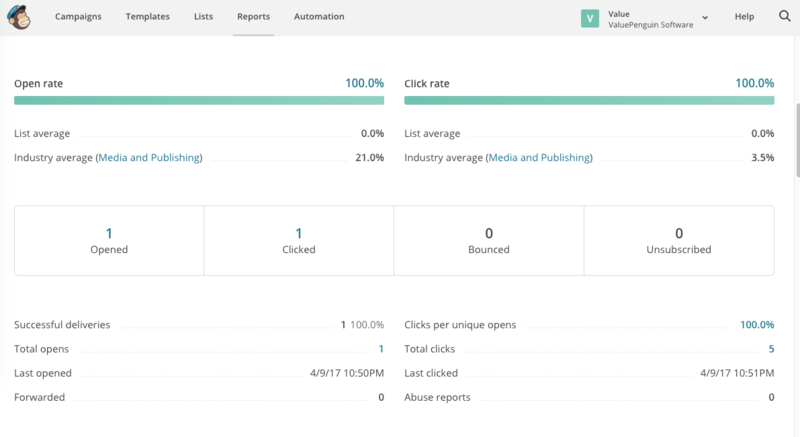 Once you create, test, and send out your email campaigns, Mailchimp will start tracking their performance and delivering analytics in easy-to-read dashboards. 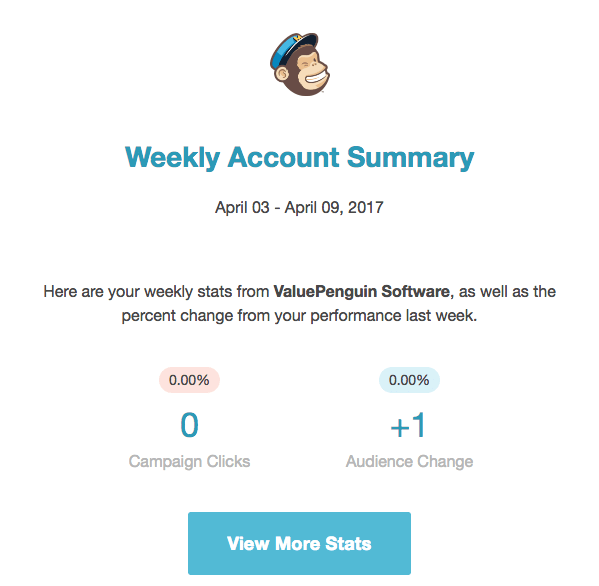 MailChimp sends a weekly account summary to your email address, so you can stay up to date without having to log into your account. This summary includes stats like the percent change in your campaign performance compared to last week, and how many unsubscribes/bounces occurred. You can click the email to view more detailed stats about your campaigns, or log into your account and click on the Reports tab to view key performance stats from your campaigns. While some of these stats are shown as counts, others are graphed over time, as line graphs, so you can visualize trends in clicks and opens over a 24-hour period, as shown below. 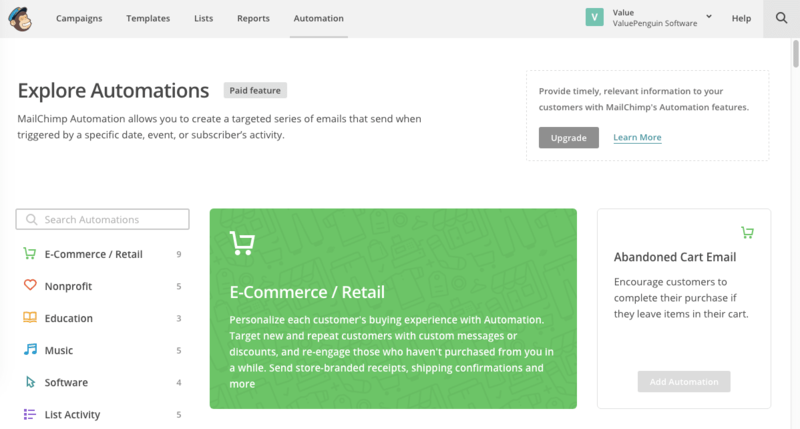 As mentioned earlier, MailChimp recently announced that marketing automations are now free for all users. Automations are simply ways to automatically kick off email campaigns based on actions that occur elsewhere in your business. For example, you can set up an automation to detect when a customer on your list hasn't purchased anything from your store in a while, and send out a targeted email with a special promotion to get that customer to reengage with your site. The level of specificity available to automations makes it a powerful aspect of MailChimp that could drive more sales and engagement across your customer base. MailChimp has many types of integrations for different types of organizations, ranging from ecommerce/retail applications, to nonprofits and software companies. Product recommendations are another feature that was recently released to all users for free. This feature can be combined with automation to drive reengagement and increase sales. For example, an ecommerce company can set up an automation that automatically sends emails with personal product recommendations to reengage customers who have not purchased anything in X amount of time. 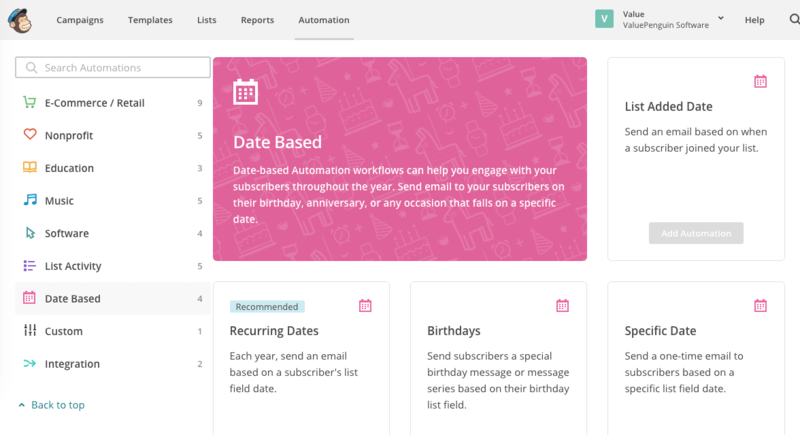 You can also set up automations that are industry-agnostic, such as date-based automations based around subscribers' birthdays, or to commemorate the date on which a subscriber first joined your email list. Is it worth it to go Pro? Pro costs an additional $199 a month, which doesn't include the baseline paid features available to regular paid accounts. However, it unlocks more powerful features such as Timewarp (described in a previous section of this post) and the ability to predict demographic characteristics of your customers, such as age and gender, so that you can predict what types of email campaigns might appeal to them. You can also conduct more advanced segmentation, which enables you to better understand your audience/customers so that your campaigns can be more successful. The two most valuable features of Pro are multivariate testing and comparative reports. Multivariate testing enables you to test up to eight versions of the same campaign, by creating slightly different subject lines, button styles, and calls to action, all in one campaign. This means that you can quickly conduct very targeted tests to see what's working, and what's not, so that you can modify your strategy accordingly. Comparative reports help you take a deep dive into all of your reports so that you can uncover various actionable insights to improve your customer's engagement with your emails. You can combine/aggregate and compare data across reports, filter and specify complex segmentation options across your subscriber lists, and save and share each resulting custom report with other members of your organization. MailChimp is a powerful marketing tool that helps businesses of all sizes (and across various industries) create professional email campaigns and analyze their performance with the resulting analytics. MailChimp is especially well-known for its ability to help businesses create professional email marketing campaigns without requiring any technical background or programming experience. In addition, businesses can easily get started for free, and then decide to upgrade to paid versions once they need more powerful features. However, many smaller businesses find that the free version of MailChimp offers virtually all of the functionality that they need, with easy-to-use email campaign templates and customizable signup forms that may help you grow your subscriber lists. If your business is more mature and already has a robust subscriber base, you may find that MailChimp's Pro account is well worth the investment if you need help with creating a strategy to generate very targeted emails that will successfully resonate across small segments of their audience. Once you've decided on MailChimp and registered for an account, you can read our guide on how to create your first MailChimp newsletter. MailChimp company acquired TinyLetter, a personal newsletter service, in 2011. While MailChimp is targeted to businesses, with free and paid tiers, TinyLetter is designed to help individuals send out emails to their connections/followers, completely free of charge.